OMG!!! Studio G Series 12 Stamps Just Fo’ Me!! My Best Scrap Pal in the World” Gay sent to them to me for a belated birthday prezzie! I’m SO excited!! 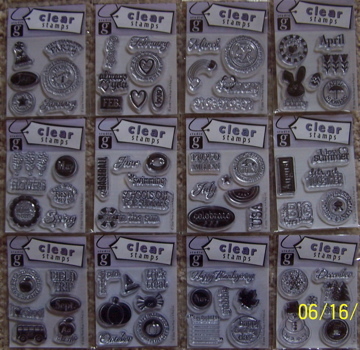 I’ve been wanting these MONTH stamps but my stupid Mike’s hasn’t carried them so far. Maybe we’ll get them in 2011 but I don’t want to wait that long, so thanks Gay! You totally rawk, girlie! She gots me sum MAMBI rub-ons and Soft Spoken with a Family/Faith theme, as we have vowed to both work on our Faithbooks. Along that line, Gay shared with me her favorite Bible study author, Beth Moore. 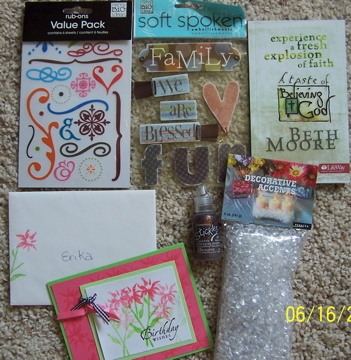 Then some yummy brown Stickles, clear skittles, and a beautiful handmade card. 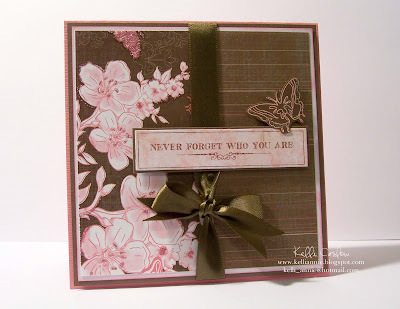 I SO don’t have cardmaking talent, so I really appreciate it in those who do. It’s just so, so pretty. I may have bitten off more than I can chew…but, oh, is it delicious! I have so many scrap ‘thangs’ going on right now and there never seems to be enuf time to do them (ummmm, Erika, you could, like, get off the computer….). So! I have 2 sets of ATC CARDS to make for swaps over at the AMR MESSAGE BOARD. The first one is hostessed by MARTHA and it’s called Your Favorite Verse. So I’m making 14 ATC’s with my favorite Bible verse to exchange with the other ladies. I signed up for this some time ago, and I can’t tell you how many verses I’ve seen or thought of and gone, “Oh! That would be perfect for my ATCs!” and then I find another one I like too and another and another (have you noticed the Bible is FULL of good stuff?!). The deadline is 5/23/08 so I need to decide on a verse…and actually MAKE them, LOL! I think I have it down to 2 verses, one which is actually my favorite but I can’t think of a visual to go with it, kwim? Whereas the other one has the words “apple of my eye” in it, so I could clearly have a theme or a visual. What should I do? The second ATC swap is hostessed by Jingle (she also ran the first/only other ATC swap I’ve ever done; I talked about it HERE and HERE). It’s called Drink It Up! and you “Choose your favorite soda, smoothie, coffee, tea, or cocktail and create your ATC’s all about it!” It won’t be any surprise to my AMR girlz that my Drink It Up ATC will somehow include StarCrack…er, um…I mean, STARBUCKS. I’m positively addicted to a certain fine drink at that establishment. You’d think with the price of gas and the fact that I”m about to be laid off my job, I would be able to quit those things but nah. Still hooked like a sad, sad junkie. THEN…I have a new Scrap Pal on AMR who I’ve been getting to know through PM’s. Her name is Gay aka “Gaybow” and she’s a total sweetheart. We have a lot in common – Christian, trying to lose weight (well, I’m TRYING, she actually IS…), and we’re both scrappers who’re addicted to AMR. Part of being a Scrap Pal is sending each other little gifties on our birthdays, Easter, Christmas, and just whenever we see something that we know they’d like. We live on opposite ends of this fine country…you gotta love the internet. This is going to be fun! Fourthly (yep, uh-huh, I was an English major and “fourthly” is an actual word). (Okay, just kidding, I made it up on the spot). FOURTHLY, I’m involved with a little sneaky surprise that we have going on at AMR to help out one of the message boarders. It’s a big secret, so keep yer trap shut about it! Got it?? Good. Now quit asking me! That’s all I’m gonna say about that. (Is it just me, or is there a trend here??? AMR seems to be the culprit). Herm…..let me think….anything else I’ve gotten myself involved in??? Oh yeah, I’m planning another crop for early June and I haven’t even fully unpacked from the May one yet. 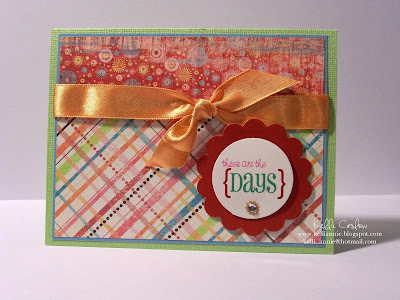 I have 2 cards to make and some scrappy things to mail out; as always, I’ll look to KELLIEANNIE for card inspiration. The girl has talent, and even her own CARD GROUPIES. Here are some recent samples of her work (I stole these images from Kelli’s blog, but they are watermarked so it’s okay). The biggest thang I have going is a scrapbook-related business venture (in addition to the 2 I already have) that I’m about 90% ready to unleash on the world. There have been many late nights working on that one. I’ll post about it here when it happens. My fellow Scrapbook Obsessed peeps are always the first to know!